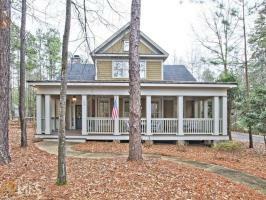 143 White Oak Road is a wonderful 4 bedroom, 4 1/2 bath home located in the Longleaf neighborhood at Callaway Gardens. Great large kitchen with island and breakfast bar and beautiful granite counter tops with stainless appliances. Kitchen, dining and living area are all one expansive room which opens to spacious screen porch. Master bedroom is on the main level and opens to screen porch. Master bath has his and her vanities, garden tub and separate shower. Large walk in closet is off master bath. Second bedroom with private bedroom is located on main level. 2 bedrooms located upstairs with large Jack and Jill bathroom. Loft area is the perfect space for a bunk room and also has its own private bath. Detached 2 car carport with storage.